It’s hard to believe but Advent is right around the corner. Are you searching for a meaningful Advent practice to bring more faith and spiritual growth into this busiest of seasons? 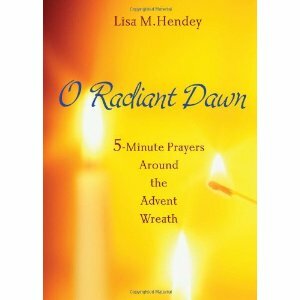 O Radiant Dawn: 5-Minute Prayers Around the Advent Wreath (Ave Maria Press, 2012) may be just what you are looking for. Lisa Hendey, founder of CatholicMom.com and best-selling writer of The Handbook for Catholic Moms and A Book of Saints for Catholic Moms, offers a series of twenty-eight short reflections, one for each day of Advent. The title of the booklet comes from one of the “O Antiphons” of Advent: “O Radiant Dawn, splendor of eternal light, son of justice; come, shine on those who dwell in darkness and the shadow of death.” It is a reminder to reflect on the glory of God’s majesty, a majesty we often miss when we are preoccupied with ever-growing to-do lists. O Radiant Dawn is truly a great gift in a small package. It would be a perfect devotional to make available in large numbers to parish communities. Those who use it will find their Advent season to be greatly enhanced, with the emphasis placed first where it rightly belongs – on the coming of Christ.